For the past few months I have been working out with a personal trainer, getting a bit of help acclimating to the Mile High City. About three weeks ago I sprained my elbow (roller skating, because I am a cool kid like that) and had to lay off the weights for a while. Now that I am back in the gym doing more than just my cardio workouts I am feeling it. 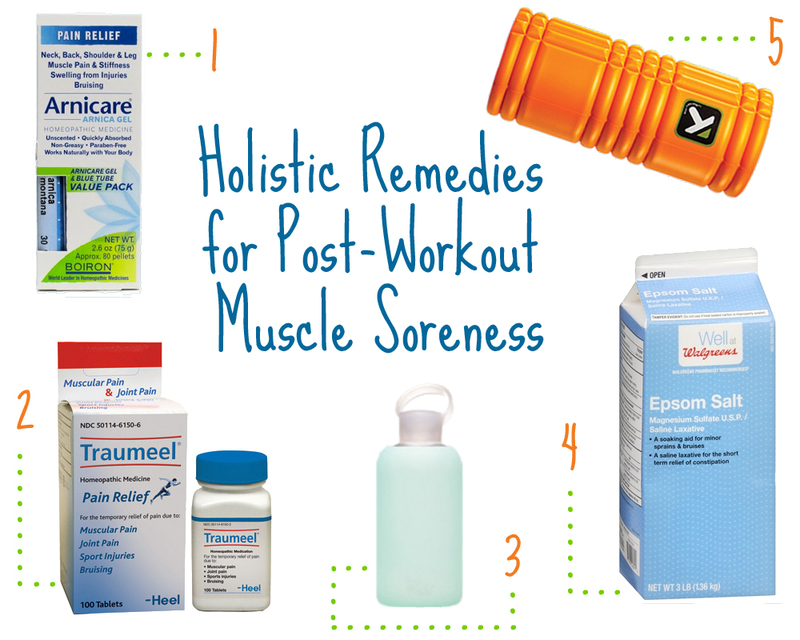 So I thought I would share some of the things I use to combat my post-workout soreness. 1. Arnica Montana. I absolutely swear by arnica. Get an unsightly bruise? Lather some on and it is gone in what seems like 24 hours, sore muscles? Same deal. Arnica is a flower that has properties that help to alleviate inflammation (one of the reasons your muscles are sore), bruising, aches and pains. I take it internally using the tablets (which taste like sugar-bonus!) and apply it externally to the affected area so I get it working from the inside out and the outside in. 2. Traumeel. Traumeel is a tablet that you dissolve under your tongue made up of 12 natural ingredients that all have healing qualities. These pain relievers and anti-inflammatories include Belladonna, Calendula, and Echinacea. (For the full list click here.) Essentially, Traumeel acts like a holistic ibuprofen. 3. Glaringly obvious- but drink LOTS of water! Water helps to flush out the lactic acid that is built up in your muscles after a workout. Flushing out the acid and other toxins will help you feel better quickly. Having a fun water bottle on hand helps you to remember to guzzle water! 4. Epsom Salt. Epsom salt has so many uses (one of which you can see in my Weekend Warrior Detox) but adding it to a warm bath to relieve muscle soreness through reducing inflammation is my favorite. 5. A Foam Roller. Essentially an at home sports massage, a foam roller helps to unwind the knots and tightness caused by working out. The GRID foam roller uses its interesting design to specifically target trigger points, which can be painful, but is great for releasing tension. *Please note that some people might get DOMS, delayed onset muscle soreness, which is essentially a more intense soreness caused by muscle trauma (small tears in the muscle), so while foam rolling can work to help relieve some of the soreness, tread lightly. Make sure you are stretching well before and after your workouts, and remember, light cardio brings blood to the surface of your muscles aiding in muscle recovery. So, while all you might want to do is sit on the couch and watch Swamp People, make sure you continue to keep your blood flowing! Do you have any tips to add to this list? Let me know in the comments below! I am not a doctor nor am I a personal trainer. The tips I have included above are what work for me; make sure to consult your physician before utilizing them. Arnica is a GREAT one! I used that nightly when I was playing roller derby (its' good for bruises). Now I take glutamine to help my muscles recover from lifting. I also like to focus on foods that reduce inflammation – I make a cherry-ginger protein shake specifically for recovery. Turmeric is another good one. Great post! I'm too chicken to try an ice bath but I think I'll try the epsom salt and arnica montana! ooh must try the arnica! Looking forward to spending the next little while creepin' you're older posts!! I swear by Arnica too & also have heard rave reviews about Epson salts. Thanks for sharing! I swear by Epsom Salts! Wonderful remedies! Hi, Kait! I enjoy roller skating too! (Because we’re cool kids!) Hahaha. I love Epsom salts and it helps me relax so much better. Thanks for the tips above. Xoxo.